NIH Consensus and State-of-the-Science statements are prepared by independent panels of health professionals and public representatives on the basis of (1) the results of a systematic literature review prepared under contract with the Agency for Healthcare Research and Quality (AHRQ), (2) presentations by investigators working in areas relevant to the conference questions during a 2-day public session, (3) questions and statements from conference attendees during open discussion periods that are part of the public session, and (4) closed deliberations by the panel during the remainder of the second day and morning of the third. This statement is an independent report of the panel and is not a policy statement of the NIH or the Federal Government. The statement reflects the panel's assessment of medical knowledge available at the time the statement was written. Thus, it provides a "snapshot in time" of the state of knowledge on the conference topic. When reading the statement, keep in mind that new knowledge is inevitably accumulating through medical research, and that the information provided is not a substitute for professional medical care or advice. Improvements in medical science and health care have gradually changed the nature of dying. Death is no longer predominately likely to be the sudden result of infection or injury but is now more likely to occur slowly, in old age, and at the end of a period of life-limiting or chronic illness. As a result, a demographic shift is beginning to occur that will include an increase in the number of seriously ill and dying people at the same time that the relative number of caregivers decreases. To meet this challenge, the best evidence that science can offer must be applied to guarantee the quality of care provided to the dying individual and their surviving loved ones. The 1997 publication of the Institute of Medicine report ï¿½Approaching Death: Improving Care at the End of Lifeï¿½ triggered a series of activities to improve the quality of care and the quality of life at the end of life. Notable among these activities, the National Institute of Nursing Research (NINR), part of the National Institutes of Health (NIH), began a series of research solicitations that focused on issues related to end of life. Topics of the NIH initiatives have included: the clinical management of symptoms at the end of life; patterns of communication among patients, families, and providers; ethics and health care decisionmaking; caregiver support; the context of care delivery; complementary and alternative medicine at the end of life; dying children of all ages and their families; and informal caregiving. Research initiatives by the Robert Wood Johnson and Soros Foundations have also advanced the field. To examine the results of these many efforts and to evaluate the current state of the science regarding care at the end of life and to identify directions for future research, the NIH convened a State-of-the-Science Conference on Improving End-of-Life Care. The conference was held on December 6ï¿½8, 2004, at the NIH in Bethesda, Maryland. The NINR and the Office of Medical Applications of Research (OMAR) of the NIH were the primary sponsors of this meeting. The Centers for Disease Control and Prevention, the Centers for Medicare & Medicaid Services, the National Cancer Institute, the National Center for Complementary and Alternative Medicine, the National Institute of Mental Health, and the National Institute on Aging were the cosponsors. The AHRQ supported the NIH State-of-the-Science Conference on Improving End-of-Life Care through its Evidence-based Practice Center program. Under contract to the AHRQ, the RAND Corporation and its partner, Veterans Administration Greater Los Angeles Healthcare System, developed the systematic review and analysis that served as important background for discussion at the conference. What defines the transition to end of life? What outcome variables are important indicators of the quality of the end-of-life experience for the dying person and for the surviving loved ones? What patient, family, and health care system factors are associated with improved or worsened outcomes? What processes and interventions are associated with improved or worsened outcomes? What are the future research directions for improving end-of-life care? On the final day of the conference, the panel chairperson read the draft statement to the conference audience and invited comments and questions. A press conference followed to allow the panel to respond to questions from the media. 1. What defines the transition to end of life? The evidence does not support a precise definition of the interval referred to as end of life or its transitions. End of life is usually defined and limited by the regulatory environment rather than by the scientific data. A regulatory definition is a barrier to improving care and research relating to end of life. End of life should not be defined by a specific timeframe unless evidence can support reliable prognostication. There are individuals for whom identification of end of life is relatively clear; however, data support that this is relatively uncommon. The data demonstrate that it is not possible to accurately predict an individualï¿½s time of death. There has been a lack of definitional clarity related to several concepts and terms, such as palliative care, end-of-life care, and hospice care. Too often these terms are used interchangeably and the distinctions for each term must be clarified to patients and their families, providers, policymakers, and investigators. The lack of definition for the key terms represents a barrier to research in improving end-of-life care. There is insufficient evidence to determine what differences exist in the definitions of the end-of-life experience based upon gender, race, region, or ethnicity. Respect for choice (patient or proxy), especially at the end of life, is a central value. However, patient and provider expectations and/or the desire for resource-intensive therapies with a small chance of benefit may clash with societal priorities. There is no exact definition of end of life; however, the evidence supports the following components: (1) the presence of a chronic disease(s) or symptoms or functional impairments that persist but may also fluctuate; and (2) the symptoms or impairments resulting from the underlying irreversible disease require formal (paid, professional) or informal (unpaid) care and can lead to death. Older age and frailty may be surrogates for life-threatening illness and comorbidity; however, there is insufficient evidence for understanding these variables as components of end of life. Life is a continuum and individuals traverse this continuum facing illnesses and limited functionality. Evidence does not support defining end of life as crossing an arbitrary threshold. Administrative thresholds may be justifiable but should be based on solid science. The end-of-life process includes numerous transitions: physical, emotional, spiritual, and financial. There are also transitions in health care systems exacerbated by the lack of continuity among caregivers, challenges to social support networks, unshared clinical information, and multiple physical locations for care. Family members experience role transitions, stress, and, ultimately, bereavement as their loved one traverses lifeï¿½s continuum. Family and professional caregivers face similar challenges as well. 2. What outcome variables are important indicators of the quality of the end-of-life experience for the dying person and for the surviving loved ones? The outcome domains and measured variables for the end-of-life experience have been described in several documents: ï¿½Describing Death in America, What We Need to Knowï¿½ (prepared by the Institute of Medicine), ï¿½Clinical Practice Guidelines for Quality Palliative Careï¿½ (prepared by the National Consensus Project for Quality Palliative Care), and ï¿½End-of-Life Care and Outcomesï¿½ (prepared by Southern California Evidence-based Practice Center RAND Corporation) as well as expert testimony and public comment presented to the panel. Examples of broad outcome domains related to end of life include physical or psychological symptoms, social relationships, spiritual or philosophical beliefs, hopes, expectations and meaning, satisfaction, economic considerations, and caregiver and family experiences. Quality of life is a domain commonly proposed as an end-of-life outcome. However, the association between quality of life and end-of-life care could be strengthened by clear definitions and consistent measurements of quality of life . The outcome domains are influenced by structure and process variables. Examples of structural variables of care include settings, provider education, demographics, geography, information systems, political systems, policies, regulations, and finances. Examples of processes of care domains include disease, syndrome and symptom management, continuity, goals and plans, monitoring and quality management, decisionmaking, and communication. Valid measures exist, as applied to some aspects of end of life, among individuals with cancer. However, these same measures have not been used consistently or validated longitudinally in other diseases or in diverse settings or with diverse groups. Proxies, defined as surrogate responders for persons at end of life, are frequently the only source of measurement for an end-of-life outcome. The evidence indicates that proxies report objective states, such as mobility, more accurately than they report subjective states, such as pain, depression, or fatigue. Missing data are a limitation of most measures when used in persons at the end of life. Many measures may not be of use among persons with severe cognitive and/or communication disorders. There are insufficient measures for evaluating end-of-life outcomes among children and their caregivers. Few tools have undergone rigorous examination for conceptual and measurement equivalence among groups sampled from ethnically diverse populations. 3. What patient, family, and health care system factors are associated with improved or worsened outcomes? In general, research on the patient, family, and system factors that improve or worsen outcomes is limited. The research that has been conducted has used small samples and studies of narrowly defined populations. Thus, the results may not be applicable to larger groups or patients with diverse racial and ethnic backgrounds. Among the most important factors to be considered are: race, culture and ethnicity, socioeconomic status, sexual orientation, disease states, age, settings of care, and level of disability. All require further study. Although race, culture, and ethnicity are difficult to define, they are associated with disparities in access to health care, quality of health care delivery, and health care outcomes. The reasons for these disparities are multiple, including provider factors (stereotyping and provider bias), patient factors (different values, attitudes, beliefs, and preferences in end-of-life care), and other health care system factors (inadequate translation and interpreter services). Disparities have been shown in the treatment of pain and symptom management in end-of-life care. Some minority groups have shown a preference for more intense therapy rather than hospice at the end of life. Additionally, minorities are underrepresented in end-of-life research. Disease state can also affect end-of-life care. Whether one has cancer, heart disease, or dementia affects the pattern of functional decline, ability to interact with health care providers, attitudes of health care providers and caregivers, and manifestation of symptoms. Most of the end-of-life research has been done in patients with specific single disease states, such as cancer, and to a lesser extent in dementia. Moreover, the sickest patients and those with comorbidities are often excluded from research studies. Assessment and management of symptoms have been most thoroughly studied in patients with cancer. However, other life-limiting illnesses, such as congestive heart failure, end-stage renal disease, chronic obstructive pulmonary disease, liver failure, and dementia, present their own unique challenges in end-of-life care. For example, in the case of dementia, providers often do not recognize dementia as a terminal illness. Communication is more complex, often due to cognitive deficits and the need for surrogate decisionmakers. Tools for measuring end-of-life care and to evaluate outcomes have not been validated in patients with dementia. Setting of care, level of disability, and age are other factors that influence outcomes in end-of-life care and bereavement. The level of training of staff varies across settings and types of care (e.g., nursing homes, community hospitals, university hospitals, and hospice). The most functionally disabled patients require substantial support for basic activities of daily living. Of special note, there is a dearth of evidence on end-of-life treatment of children. The evidence comes from small, single site studies. What evidence there is suggests that fear of being forgotten, fear of pain, and fear of causing family sorrow, while common across patients of all ages, may represent unique challenges for children and their families. Recent reviews show that there are no instruments available for measuring the end-of-life experience in children. Due to this lack of data, it is difficult to draw broad conclusions. Researching the end-of-life experience in children and adults is complicated by the fact that institutional review boards are especially sensitive to the distress of the dying children and their families as well as to other vulnerable populations and, therefore, are reluctant to approve such studies. General system factors can also affect outcomes. At the health care system level, one of the biggest problems noted is that care is fragmented, consisting of multiple providers, and requires the patients to make many transitions in their care. Other problems include lack of flow of information across providers and settings as well as different skill levels of providers and financial incentives that perpetuate discontinuity and discourage high-quality care. Research is needed to create and evaluate models of care. Some models of effective integrated care at the end of life have been developed, usually in academic settings or in closed health care systems (most notably within the veterans health care system). They have not been applied or evaluated in the settings where most persons at the end of life receive their care. The design of the current Medicare hospice benefit limits the availability of the full range of interventions needed by many persons at the end of life. These design limits include, for example, a 6-month prognostication to death; a forced choice between skilled care and hospice care for Medicare patients entering nursing homes from hospitals; limitations on the availability of therapies, such as radiation for symptom management; and requirements for ï¿½pass throughï¿½ payments between hospice and nursing home providers. Furthermore, although hospice has been a leader in the evolution of end-of-life care, the research on the hospice program is limited. The two randomized studies were conducted more than 20 years ago. More recent observational studies suffer from selection bias because they are limited to those who have chosen the hospice benefit. Attention must also be paid to how State Medicaid policy affects end-of-life care for the significant number of patients who are ï¿½dually eligibleï¿½ for Medicare and Medicaid. In theory, this creates the potential for integrated care (as demonstrated in PACEï¿½the Program for All-Inclusive Care for the Elderly). There is evidence that state policy often creates barriers to care that need to be identified and addressed. 4. What processes and interventions are associated with improved or worsened outcomes? There is a growing body of research related to specific care interventions designed to improve outcomes for the end-of-life experience for patients and families. These include interventions in symptom management, spiritual aspects of dying, withdrawal of life-sustaining treatments, family caregiving, and bereavement. Effective communication is critical to the success of these interventions. The following findings from these studies are of note. The quality of evidence on symptom management appears to be limited, with the exception of pain management. Although considerable research has been done regarding the use of medications in the management of pain, these protocols have not been widely incorporated into practice. While specific end-of-life curricula have been developed, they are being used inconsistently to train health care professionals. They have not been evaluated and the outcome of the training is not known. Conclusions regarding the benefits of symptom management with complementary and alternative medicine suffer from insufficient numbers of studies, small samples, and weak study designs. Studies in the area of bereavement interventions indicate that, for some groups of adults, interventions are most effective when requested by the grieving party. More studies are needed to evaluate the more complicated forms of grief, especially in particularly vulnerable populations, including grieving children. Encouragement to initiate advance directives (i.e., legal documents, such as living wills and health care powers of attorney) alone have not been shown to improve outcomes among individuals with diseases other than dementia; however, the reasons for this are not well-known. Little evidence of the effect of advance directives on care of people with impaired decisionmaking ability was presented. Advanced-care planningï¿½a process for preparing for the end of life, including discussion of deathï¿½ is different from advanced directives and needs further study to examine its effectiveness. generates gratitude and complaints and is an important component of palliative care. Some studies have shown improvement in communication skills of providers. Others have shown that physicians and nurses sometimes underestimate or do not elicit the full range of patient concerns and do not show empathy. A majority of the studies on interventions to enhance communication have been done outside the United States in small samples, which yielded intriguing results. It is not known how these will translate into the U.S. population. Effective multidisciplinary communication may be particularly important in the case of children where parents are the primary decisionmakers. In particular, the absence of realistic hope with regard to pain and suffering has been shown to diminish the responsiveness of parents to initiating end-of-life discussions. Spirituality is consistently defined as a critical domain in end-of-life care; research on interventions to improve spiritual well-being is very limited. Preliminary evidence of a specific interventionï¿½dignity therapyï¿½shows positive outcomes for both the patient and family in terms of satisfaction and heightened sense of dignity, purpose, meaning, and grief management. Research on withholding and withdrawing life-sustaining treatment has been conducted most often in the intensive-care setting. Family caregivers are central to end-of-life care because they provide emotional support and essential help with activities of daily living, medications, and eating as well as communicate with health care professionals. Although both educational and supportive interventions have been tested, only a limited number of randomized clinical trials have been conducted with caregivers of patients near end of life. There is limited information, aside from dementia, and little information about culturally diverse populations. However, there is a lack of data regarding which caregivers are at greatest risk for distress and which interventions are likely to relieve that distress. Little evidence was provided regarding the experiences of professional caregivers at the end of life. There is a need to examine their experiences and projections regarding future availability. Most interventions tested are either not theory-based, or the theories they are based on are not stated explicitly. Details of interventions are not always available in publications of results or in protocol manuals that are publicly available. As a result, these interventions cannot be replicated, improved, or tested in other care settings. interventions is not always provided in the same way and separate components of multicomponent interventions cannot be evaluated so that programs can be improved. Fidelity to components of multicomponent interventions is not typically examined; as a result, it is not known how different component interventions are used and by which groups of patients and providers. Many of the studies are limited to small numbers of patients in select care settings and in select patient populations, thereby limiting generalizability and restricting the ability to demonstrate null effects. Many studies either do not rely on randomized designs or do not include comparison groups, which limits the ability to draw conclusions about the effect of the treatment versus the usual outcome course. Many different outcome measures have been used. While not necessarily a limitation for any single study, the use of a diverse set of outcome measures limits the ability to draw comparisons across studies of the same or different interventions. Few of the intervention studies include assessments of costs to patients, families, or the health care system; and few studies evaluate the cost-effectiveness of interventions. Without these assessments, it will be difficult to judge the extent to which they can be implemented in real-world contexts now or in the future. 5. What are future research directions for improving end-of-life care? 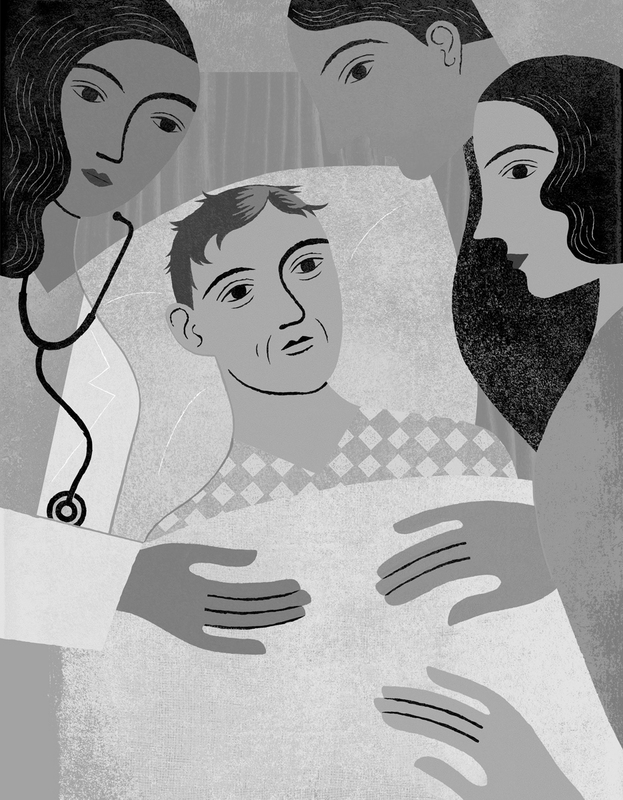 End-of-life care has emerged as a field of scientific inquiry in the past two decades. It is a vitally important area to public health in terms of resource considerations and to individuals. All people will die. Most deaths are not sudden. Most persons will experience death also as caregivers or family. While there is a growing body of research covering a wide range of issues, the research is, in many ways, still in its infancy in terms of rigorous testing and evaluation of models of care, in terms of patients and family outcomes, and in terms of resource utilization. Research is needed to understand patient, caregiver, and health care system influences on these outcomes. Develop conceptual models/frameworks to guide the full range (qualitative and quantitative, descriptive, and randomized-controlled trials) of systematic research in end-of-life care as it affects patients, families, and care providers. This would include providing operational definitions of end-of-life and palliative care. Efforts should be made for further development and consensus about common definitions and constructs as they relate to end-of-life and palliative care. Create a network of end-of-life investigators and well-defined cohorts of patients to facilitate coordinated interdisciplinary, multisite studies. This should include establishing new networks of end-of-life investigators as well as expanding existing networks (such as the National Clinical Trials Cooperative Groups) so they have a critical mass of end-of-life investigators and appropriate study populations. These networks should enhance training of a new generation of interdisciplinary scientists (through funding mechanisms, such as K-awards, T32s, and R25s). Develop a consensus regarding a minimum set of measures that can be used to assess end-of-life domains in well-defined cohort studies established at multisites. Categorize measures in terms of several factors, including source of information (e.g., patient, family, staff), level of information (e.g., self-report, observational rating, physiological), cognitive requirements (e.g., can be obtained from communication impaired, level of cognitive capacity required), and validation samples (e.g., was validated among minority groups). Measurement tools require testing for equivalence, validity, and sensitivity to change within and across well-defined disease, racial, ethnic, age, gender, and cultural groups. Determine and seek to improve the reliability and validity of data obtained from proxies as they vary by rater, relationship, domain, and over time. Develop and utilize instruments with an awareness of minimizing burdens on patients near end of life and their families. Attend to normative ethical questions regarding such things as the concept of a good death, and identify and resolve ethical problems in end-of-life care that arise from conflicting needs of caregivers and care receivers. Explore ethical issues in end-of-life research pertinent to institutional review boards, ethics committees, and study sections to reduce barriers to conducting research without compromising ethical standards. Develop and test new interventions in diverse patient groups with a variety of primary and comorbid conditions to improve the end-of-life experience for patients and their loved ones. Develop and test new interventions, including complementary and alternative medicines, to improve symptom management in diverse patient groups. Determine how individual, family, and health care system factors affect responses to care in home, hospice, long-term, and acute care settings. Study effective communication and documentation of components of end-of-life discussions in advanced-care planning. Develop and evaluate strategies for translating efficacious interventions to enhance end-of-life care into practice in a broad array of real-world settings, and evaluate the cost and effectiveness of these interventions through rigorously designed research. Increase knowledge related to patient preferences for information and establish a strong link with specific communication behaviors and outcomes. Identify strategies to enhance care provider communication skills surrounding end of life. Studies should be attentive to the recruitment of underrepresented populations, and the studies should be adequately powered to evaluate well-defined subgroup (e.g., disease, race, ethnicity, age, region, gender) differences. This will likely require multicenter studies. The creation of end-of-life research networks will facilitate representative samples along with larger sample size, encourage uniformity in measures, and increase interdisciplinary collaboration. Intervention trials for patients at end of life should include some focus on family caregivers, especially in cases such as dementia and ventilator-dependent patients. Conduct demonstrations in and across clinical settings to evaluate the outcomes and costs of models of care delivery to determine their economic and clinical feasibility in real-world settings. Attention must be paid to the surviving loved ones of those who die from sudden or accidental death. Research needs to be conducted to evaluate the needs of this population. Increase the funding of end-of-life research within the NIH, the AHRQ, the Health Resources and Services Administration, the Department of Veterans Affairs, the Centers for Medicare & Medicaid Service, the Department of Health and Human Services, and the Centers for Disease Control and Prevention. Encourage interinstitute and interagency coordination and funding of end-of-life research. End of life is pertinent to most patient populations, including such diverse populations as children and people with end-stage organ failure, including heart, lung, and kidney, as well as those with cancer, dementia, psychiatric disabilities, and addictions. Explore publicï¿½private partnerships related to end-of-life research support. Develop, test, and evaluate new models of end-of-life care for Medicare beneficiaries designed to overcome identified limitations of and barriers to utilization of the current Medicare hospice benefit. Conduct studies of State Medicaid policy to identify barriers to and financial disincentives for effective end-of-life care. Increase Federal funding to enhance health care provider knowledge related to end-of-life research to ensure the timely translation of research findings to clinical practice. Develop and use retrospective data from representative samples of Americans on the health, quality of life and care, and use of health care resources in the period preceding death. To further develop and enhance capabilities in this area, we endorse the recommendations of the 2003 Institute of Medicine report ï¿½Describing Death in America,ï¿½ which calls for support of researchersï¿½ use of existing data systems, improving the use of existing data systems, and conduct of a new National Mortality Followback Survey. Circumstances surrounding end of life are poorly understood, leaving many Americans to struggle through this life event. The dramatic increase in the number of older adults facing the need for end-of-life care warrants development of a research infrastructure and resources to enhance that care for patients and their families. Ambiguity surrounding the definition of end-of-life hinders the development of science, delivery of care, and communications between patients and providers. Current end-of-life care includes some untested interventions that need to be validated. Subgroups of race, ethnicity, culture, gender, age, and disease states experience end-of-life care differently, and these differences remain poorly understood. Valid measures exist for some aspects of end of life; however, measures have not been used consistently or validated in diverse settings or with diverse groups. End-of-life care is often fragmented among providers and provider settings, leading to a lack of continuity of care and impeding the ability to provide high-quality, interdisciplinary care. Enhanced communication among patients, families, and providers is crucial to high-quality end-of-life care. The design of the current Medicare hospice benefit limits the availability of the full range of interventions needed by many persons at the end of life. Margaret M. Heitkemper, Ph.D., R.N. F.A.A.N. Deborah Watkins Bruner, Ph.D., R.N. Sharon McNeil, R.N., M.S., C.P.O.N. LaVera M. Crawley, M.D., M.P.H. J. Randall Curtis, M.D., M.P.H. Betty R. Ferrell, Ph.D., R.N., F.A.A.N. Irene J. Higginson, M.D., Ph.D.
Pamela S. Hinds, Ph.D., R.N. Susan C. McMillan, Ph.D., A.R.N.P., F.A.A.N. Charles F. von Gunten, M.D., Ph.D.
June R. Lunney, Ph.D., R.N. Alexis D. Bakos, Ph.D., M.P.H., R.N., C.
Ronda Hughes, Ph.D., M.H.S., R.N. Barnett S. Kramer, M.D., M.P.H. Ann M. Oï¿½Mara, Ph.D., R.N.